Submitted by lynn on Friday, November 16, 2018 - 10:32pm. 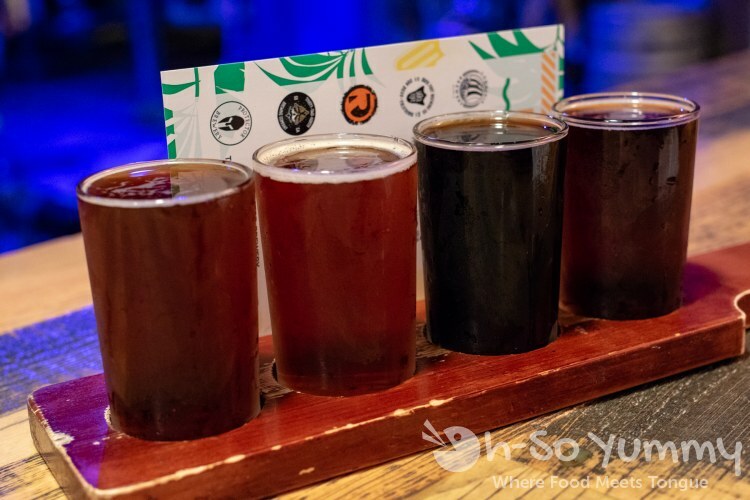 Last week was San Diego Beer Week from Nov. 2-11. I stumbled into it when a coworker invited everyone to Duck Foot Brewing, one of many breweries along Miramar Road. It just so happened to be the FIRST day of San Diego Beer Week so the timing was accidentally perfect! At Duck Foot Brewing, I found an intriguing card on our table while hanging out with the coworkers. It was for a BEER scavenger hunt, cleverly named "Beeramar" since all participating beer spots were around Miramar Road. 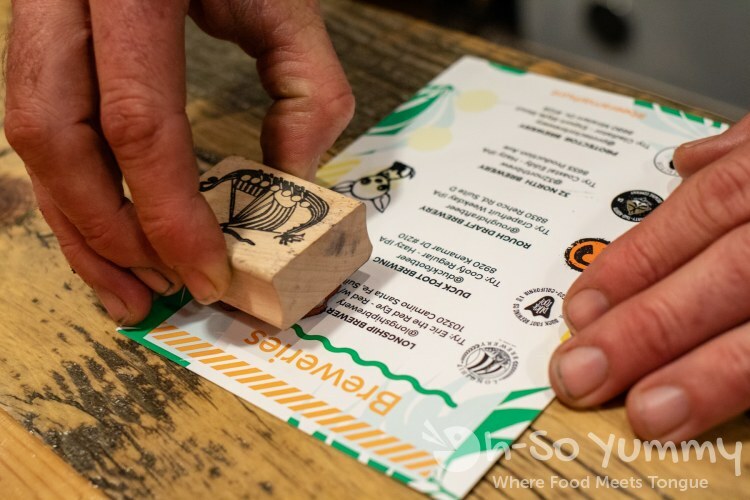 After getting a stamp at all locations, participants could collect a mystery prize. If you know me, I LOVE completing stamp cards, especially at TASTE events! Beeramar Hunt was ON! Here's the opposite side with the rules, including an IG contest! The special hashtag was #BeeramarHunt. They haven't announced any grand prize winners yet but I'm crossing my fingers! My coworker ordered a flight and let me sample one. Beerwise, I lean heaviest toward dark beers but don't mind something new here and there. 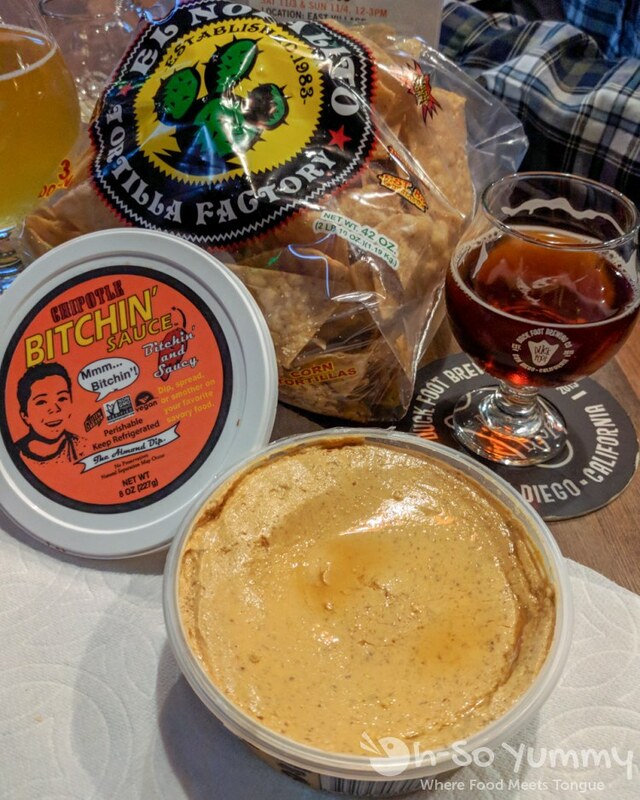 I mostly remember the Bitchin' Sauce + chips ($8) though because I was already hungry... The Chipotle flavor was yummy and everyone was snacking hard! Their chips and salsa combo snack is another great choice if you have the munchies. It's not a very big brewery and was PACKED for the start of San Diego Beer Week. I plan to come back to the brewery get a full flight for myself. The next day, I recruited Dennis to join me for some drinks. We stopped by Rough Draft Brewing to start off our evening. The ONE brew I would have ordered was a chocolate mint stout but alas.. they were out! Instead, I settled for the Amber which also had the words 'chocolate' in its description. I thought it was a solid alternative for my tastes! The stamp here was a cute chihuahua! Two down, three to go! The next stop was Longship Brewery which is the only brewery NOT that close to Miramar Road. The google map directions had us u-turning on Camino Santa Fe at Flanders Dr but the entrance is west on Flanders! It is nestled deep into a business park but the signs do help! This place has some epic neon lights around their beer vats so I knew I wanted a little bit of that flashy color in my pic! In my flight, left to right is Battle Axe, Red, Dark Deeds, and Ragnabock. My favorite was the darkest one, a little coffee forward on first sip but it soon grew on me. Battle Axe would be my next beer of choice. We did briefly meet Chuck, who is the head brewer here. The staff and vibe was very friendly here. This is just too cool not to share. 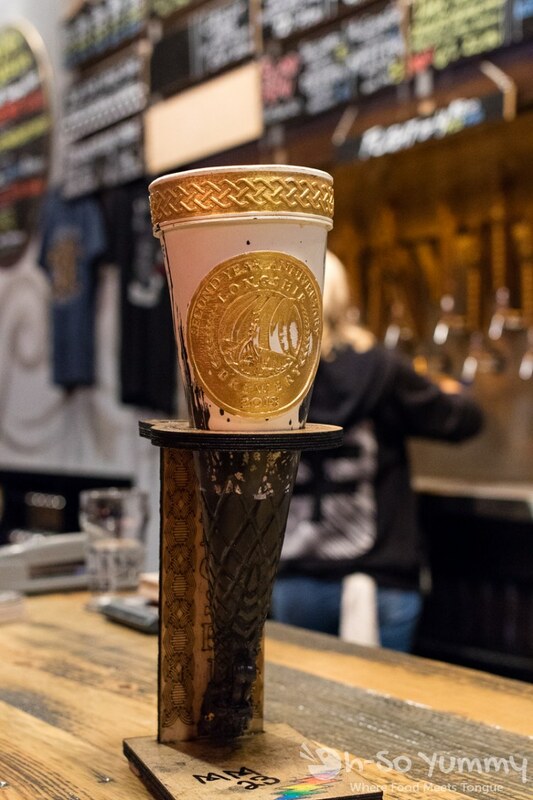 A VIKING horn beer mug! I believe it was for the brewery's anniversary. The guy who it belongs to just leaves it here and gets to drink out of it when he visits. It's like VIP status! I got swamped with work so didn't make it to another brewery until the following Saturday. 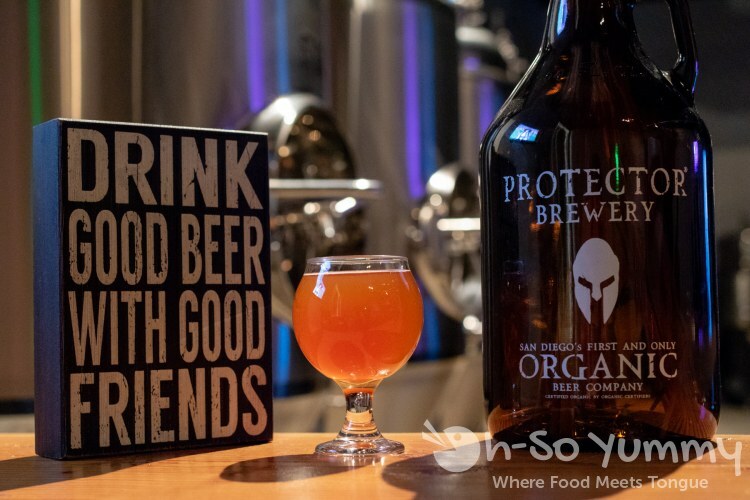 Protector Brewery is one of multiple "tasting" rooms within this business block on Miralani Circle. There's a shared parking lot so parking can be tricky sometimes. At Protector Brewery, I started out with a sample of their stouts. The Freedom Stout had a very strong, earthy flavor while the Gladiator Export Stout was heavier on the coffee. Oktoberfest, described as a malty, flavorful crisp marzen lager, turned out more to my liking. It also brought brighter contrast to my artsy beer picture! This place also hosts various events such as their recent sculp night (Nov. 14) where they craft a Spartan helmet! That looked interesting! We attempted to visit 32 North Brewing on both Saturdays of SDBW but hit private events with fancily dressed folks. No wedding crashing for us. 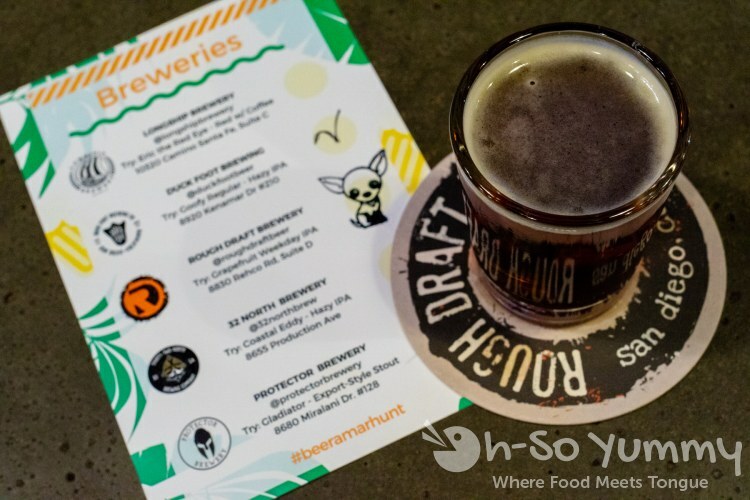 Fast forward to Sunday, the LAST day of San Diego Beer Week, and we were finally IN! This brewery was the biggest of all partipants in the scavenger hunt and has this lovely wood grain tones on the tables and walls. 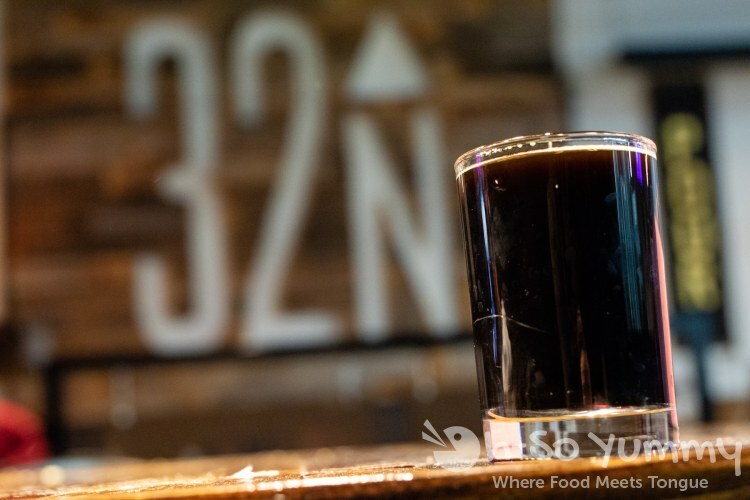 32 North Brewing had some specialty stout flavors made especially for San Diego Beer Week. There were multiple fun sounding flavors but I settled on their delicious raspberry chocolate stout. I think it's a total keeper. Please add it to the rotation? 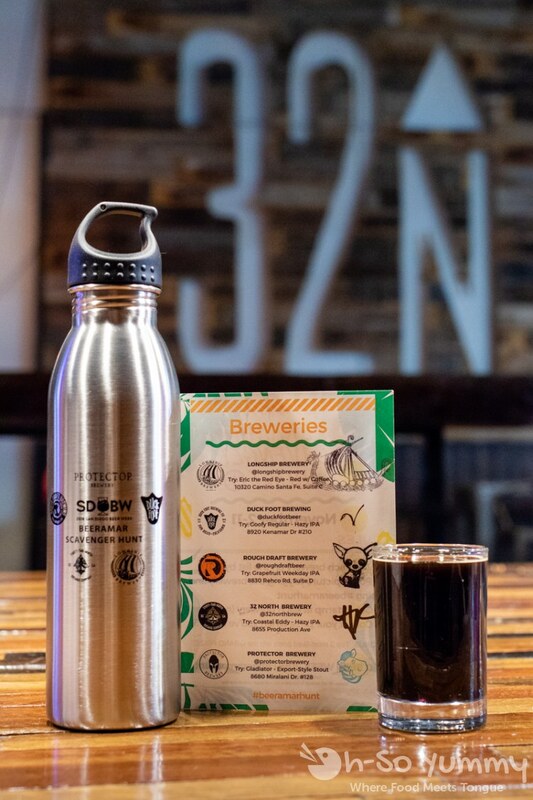 Afterwards, the girl pouring my beer gave me the final stamp as well as the PRIZE for completing the scavenger hunt... a metal canister with all five breweries listed. Hooray! 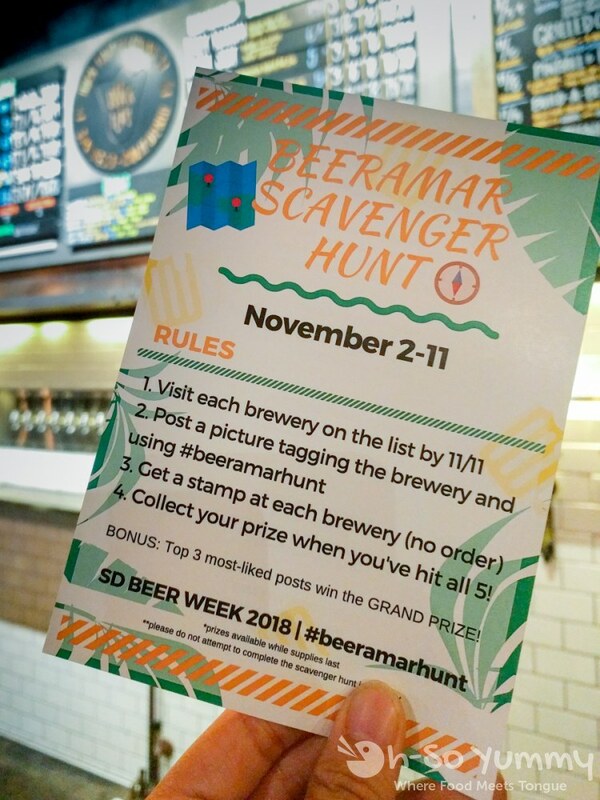 Beeramar Scavenger Hunt was a fun way to explore the brewery neighborhood plus all five were ones I'd never visited before! San Diego Beer Week may be over but I'll be making my way down this long street to catch 'em all! Hope everyone has a chance to check out Duck Foot Brewing, Rough Draft Brewing, Longship Brewery, Protector Brewer, and 32 North Brewing. Find yourself something tasty!